First Id like to say Hi to all, im a new member on this forum. 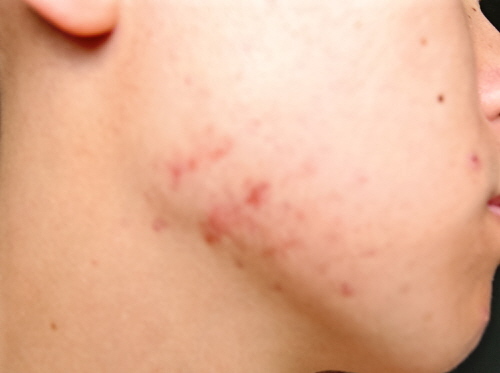 My acne seems to be undercontrol these days with a few pimples now and then but my face is still suffering from two things, extreme oilyness and these red marks over my face especially on my jaw line. I wont be asking much about oily skin cause its not the right section for it but I attached a picture of the side of my face, are these the red marks you guys are talking about? Ive had them for about 2-3 years now and they wont go away, i havent really tried to get them away cause i thought they would just eventually fade but they havent, a year ago i though it was still acne so i put BP on it but it only made it darker, some days its very light and some days it gets very red which i dont know why. I did a few searches and read a few posts on this site but there just seems to be so much different answers so i thought id ask again. Whats the most effective way of getting rid of these marks? results such as AHA came up when i tried to search for an answer, is it basically a cream that peels the skin? Honestly, I just use pure Vitamin E. It works well on "new" scars. Usually after a month the new scar would be totally gone or hardly noticable. For older scars it may take a few more months for them to be COMPLETELY gone, but they WILL fade though. I just haven`t felt comfortable trying anything else. This is the only thing I can slather on my face that wont break me out. I only apply it at night though. Anyways, maybe someone else can suggest something that may give faster results.